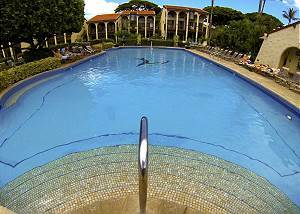 Maui Hill Resort is a relaxed Kihei condominium resort. It is located just north of Wailea, in South Kihei, a few minutes' walk from the beach. Maui Hill's location is central to many popular South Maui attractions. Great for family get-togethers or for romantic getaways, these roomy condos welcome you and your party. Maui Hill, as the name would suggest, is built on top of a hill which provides spectacular views. With affordable prices, a central location, and spacious condo suites, Maui Hill Resort is a first-rate choice for your Maui vacation accommodations. Maui Hill's spacious vacation rentals range in size from one to three bedrooms. The extensive square footage gives you and your party plenty of room to be comfortable. The units all contain the traditional comforts of home including a washer/dryer and a dishwasher. Each condo has a fully-equipped kitchen so you will have what you need to put together great meals with your party. The private lanais at Maui Hill are large as well, so everyone can fit to enjoy tropical breezes and stunning sunsets. Prepare for amazing stargazing from your lanai at Maui Hill! Maui Hill has an on-site swimming pool and Jacuzzi for you to rejuvenate in and for those who want to be active on vacation, there is a tennis court on the property and a putting green for you to practice your swing! When you want the real thing, a few miles away in the luxurious Wailea area, there are championship golf courses for you to try out. The amenities at Maui Hill are thoughtful and well maintained for you and your party to enjoy. Across the street, you will find yourself at one of Maui's most beautiful beaches, Keawakapu Beach. It is a long stretch of soft white sand that will be perfect for sunset walks on the beach, stand-up paddling, snorkeling, or just laying back and reading a book! The Kihei Boat ramp, where many different boat tours take off from, is within walking distance as well. There are also many restaurants at your convenience for those days when you don't feel like cooking. A popular restaurant, Sarento's On the Beach, has delicious breakfast and brunch and the 5 Palms restaurant at the Mana Kai resort is a great spot to watch the sunset over dinner. Imagine yourself sipping a Mai Tai on your lanai in Hawaiian paradise. You had a fun-filled day at the beach across the street exhausting yourself running wild in the waves and then you returned with your family or party to your Maui Hill vacation condo. Let yourself get lost on Maui at Maui Hill. Book today for the dream vacation you will be raving about all year!